The Fire Up 99 is a replacement top section for the Antron 99 CB antenna. I was using one on mine. The normal top section is a straight length of wire inside fibreglass but the Fire Up has a coil at the top, to lengthen the wire whilst keeping the resonant frequency at 27MHz. The A99 is a half wave normally, so to work with the existing matching circuit, the length would have to be extended to around a full wavelength. Whether it makes any difference to 27MHz performance is debatable, I've not seen a decent review of one where anybody has measured a difference before and after adding it. When I put mine up, I was replacing a broken A99 and had no known signals to compare it with. The A99 is just a half wavelength wire inside a tube, and without adding to the length, can't see there being a way of improving it on 27MHz without doing something like changing the matching circuit (there are losses in there, which would have an even bigger effect at lower frequencies - see this article). 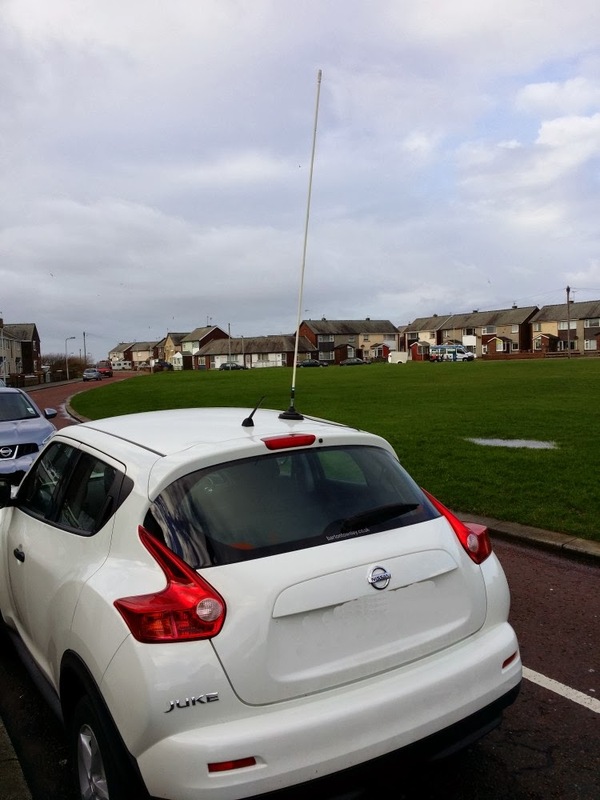 At lower frequencies the top loading might help reduce these losses, so it could be an improvement for those wanting to use it on other bands like 14 and 18MHz. I tried the Fire Up 99 on the car using a magmount which is far to small to drive anywhere with it. 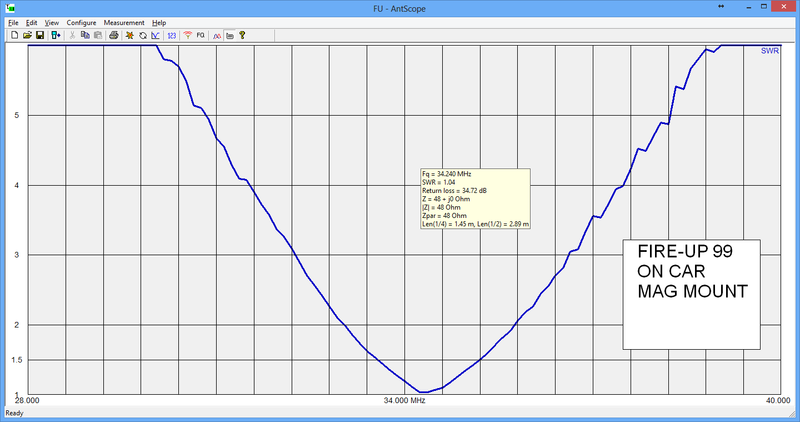 Not that it would be any use as an antenna on its own, as you can see from the SWR plots. It seems to be a 3/4 wavelength at 34MHz and a 5/4 wavelength at 55MHz. 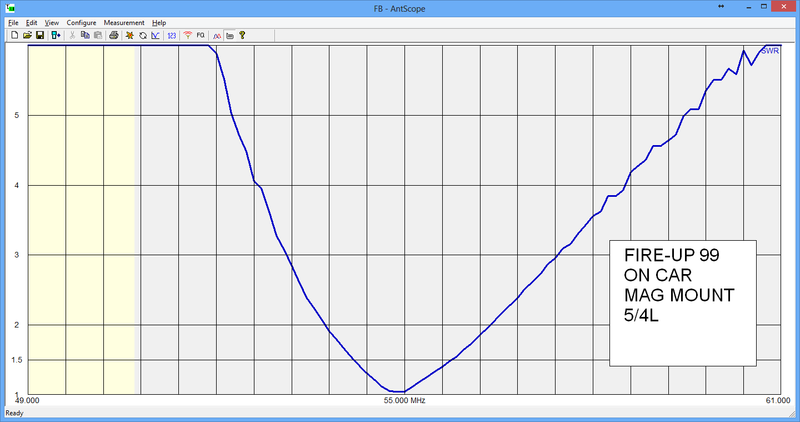 Compared to a mobile CB antenna received signals are much worse at 28MHz.